I spoke last time regarding the transformation of formerly moderate Democratic Presidents into liberal and progressive powerhouses, citing that both came to be as the result of a crisis. Even the first great wave of American Progressives were spurred on by crisis, as when Teddy Roosevelt demanded an investigation into the meatpacking industry after reading Upton Sinclair's The Jungle, even after denouncing Sinclair as a "crackpot" for his Socialist views. By its very structure, American democracy is a slow-moving, deliberative body that is usually built for incremental change. However, as I have also spoken of before, denying a large part of the population their rightly-earned prosperity through what can only be described as a New Gilded Age will only put more and more strain on gradualism and incrementalism until the entire dam bursts in a flood of Progressive ideas. The long strain of multiple labor crises, along with numerous financial crises in 1873, 1893, 1896, 1907, and others lead to the end of the original Gilded Age with the initial successes of American Progressivism. A few years later came the most explosive consequence of profits-before-people in the Great Depression, which lead to Franklin Roosevelt's New Deal, which all but culminated his cousin Teddy's Bull Moose Platforkm of 1912 in terms of Progressive achievements. For the Progressive gains of the 1960s, the horrific assassination of President Kennedy made Lyndon Johnson, once considered the conservative of the two, to champion Kennedy's Progressive ideas that lead to Medicare, the War on Poverty, and the programs of the Great Society. It seems that, for all of the destruction and obstruction that comes from right-wing ideology, it still takes something big to burst the dam for Progressivism. The cynics in the audience are now going to cluck their tongues and suggest I am advocating for catastrophe or crisis to fit my own desires with a newly-inaugurated President Clinton. To those people I only say: the crisis is already here. I am the Crisis. You are the Crisis. We are the Crisis. We can't afford a decent life, drug abuse is rampant, our food isn't fit to eat, our country wages unlawful war in our name, the climate is changing, mental health issues are boiling over into our streets, our schools are suffering, our bridges are crumbling... yes, friends... the crisis is already here. It is now up to us to let them know it. This is more than a liberal or conservative issue, but Progressives are the ones who know the way out. We've studied the History and we've seen this movie before, and we want to change the ending before it's a tragedy instead of a triumph. We are running out of time to bring our crises to the White House, the Supreme Court, and to Capitol Hill. It is time now for the great majority of Americans, suffering under a broken system, to make their voices heard so loud that even insulated with donor money and the upper-class-bubble, they can no longer pretend they can't hear us. We are in crisis, and they need to know. Get up and shout. Make a noise. Let them know we are still here, and we are struggling. If we don't do this now, we will only be walking directly into the next great catastrophe with full knowledge of how to prevent it. We could very well be at a tipping point in this election, and those we choose to put in office need to make big, bold changes and they need to make them now. We are in crisis, and we need them to know it. If not, we may very well end up celebrating the 100th anniversary of the Great Depression by landing slap-bang into the middle of a new one. I've spent what's possibly far too long looking at this election and that election, putting my History degree to best use looking for patterns tracing all the way back to 1876. If I wanted, I could probably go back further, but someone already beat me to the Andrew Jackson comparison. Instead, I'm going to dust off my Audacity of Hope and show that this November doesn't have to end with an establishment candidate being bested by an outsider, but rather the political Prodigal Son story revolving around two of our most Progressive Presidents of the 20th century. There is reason to hope, despite everything we've learned to the contrary, that upon reaching the highest office in the land a candidate can undergo a transformation. No longer do the deep pockets of donors or the shrill demands of political bosses matter, because you literally can't go any higher in America, maybe even in the world. Indeed, reaching the White House can cause a formerly conservatively minded Democrat to look at things in an entirely different way when the responsibilities of 300 million souls lay within your very hands. I want to speak about two such conservative, moderate Democrats: Franklin Delano Roosevelt and Lyndon Baines Johnson. Roosevelt's campaign for president was necessarily cautious. His opponent, President Herbert Hoover, was so unpopular that FDR's main strategy was not to commit any gaffes that might take the public's attention away from Hoover's inadequacies and the nation's troubles. As shocking as it may seem, FDR ran a rather conservative campaign, much different from the Democratic Socialism he became known for with the New Deal programs. It was in the time between his election and his inauguration (which had been moved up to January specifically to get him working on fixing the problems earlier than previous Presidents) that he realized the amazing burden and responsibility placed on him, and he became that great liberal, progressive bastion we know and honor today. In 1937, FDR met a young man named Lyndon B. Johnson, a fellow New Deal Democrat who was just starting out on what became a long career in government. Twenty-three years later, LBJ would find himself as a Vice Presidential candidate to another in a long line of charismatic, starry-eyed young Democrats named John F. Kennedy. Kennedy was a candidate that promised pie-in-the-sky reforms and made promises no one thought he could keep, including Johnson. Johnson even formed a "Stop Kennedy" coalition before eventually agreeing to be the more established, conservative member on the ticket. And we all know what happened after three years of Vice Presidential frustration. Dallas, 1963, John F. Kennedy, the dreamer from Camelot, was slain. Onboard Air Force One, Lyndon Johnson became President of the United States. The more conservative, more establishment part of the ticket now found himself in the driver's seat... and he proceeded to force through, with all of his cunning and experience, every pie-in-the-sky idea JFK had envisioned. Sitting in that office, being given that responsibility... it can change a person. So it is all right to have hope as a Progressive, even though all may seem lost to a New Gilded Age of big donors, big money and big corruption. There is no shame in supporting the establishment candidate, especially when the major competition is America's latest flirtation with fascism. But it is always important to remember who changes that person when they assume the office. It isn't the donors, or the money, or the political machine. It is 300 million Americans who that President suddenly is responsible for, and it is our job to not only hold their feet to the fire, but to bring the fire to them, blazing on a torch, if need be. We are STILL a government of the people, by the people, and for the people, damn it, and the people will be heard. The people were heard when FDR took on the banks to rescue people starving in the streets. The people were heard when LBJ kept our seniors from freezing to death in their tenements. The people were heard when Jimmy Carter served four years without corruption or war. The people were heard when Bernie Sanders spoke of a political revolution. It can't end here. It won't end here. It's our country, and we have the power. All we need to do is exercise it. America is a center-left, progressive nation, and its time we made our voices heard. Our voices have changed the minds of conservative Democrats for nearly a century now, and it will happen again, of that there can be no doubt. So! 1876 turned out to have high turnout, but was underscored by governmental corruption. Exactly one hundred years later, during the country's Bicentennial, we have another case of monumental corruption, this time in the form of the Watergate scandal. For some Americans, this was the first time they had to come to terms that the government was doing horrible things behind their backs, and all in their name as Americans. The backlash was predictable, and folks turned to more earthy politicians that made them feel good again, made them hope and believe change was on the horizon... but those politicians proved to be awkward in office and had trouble pushing through reforms with a difficult to deal with Congress, full of newly elected folks out to change the system and fed up with the compromising, glad-handing idea of Congress that got us into this mess in the first place. As the primary season for 1976 shaped up, we saw a slew of Democratic hopefuls get weeded out pretty quickly. What were once thought sure things were upset by a political nobody who wasn't even holding office at the time. He ran on an outsider platform of radical change and managed to get the support of rural folks to swing him into an easy victory. The Democratic party would nominate in 1976 and outsider promising to be a reformer, and just to make sure the old guard of the party went along, they chose a more traditional running mate who was becoming well known in government circles and among the party's base. For the Republicans that year... things got harder. Their incumbent, who everyone assumed would be swept into the nomination easily, faced a surprising primary challenge from someone no one in the mainstream even thought would put up a fight. He ran on a radical platform and mobilized the base, particularly the young in the party who thought a radical change was what was needed to solve the current ills of society. In his terrific book The Invisible Bridge, author Rick Perlstein dug up this quote from the establishment campaign: 'We want a united party going into the General Election. Any motion against unity is counter-productive and damaging to our prospects next November. Much like 2016, the primary was long and ugly and led all the way to the convention, but eventually the establishment candidate won out. Unfortunately, allegations of health trouble, flip-flopping on major issues, and a pivot to the center following the primary would ultimately alienate the base and doom this candidate, who ended up losing to the outsider who no one thought would ever get this far. The election wound up being very peculiar on the map, with states that were thought to be solid Red or Blue flipping for the other candidate. It did end up being very close, but ultimately more of America wanted a reformer and someone who promised to change things rather than the standard bearer of the tumultuous status quo. In what has become an accidental essay series, I've been trying to make the best sense of this crazy, kooky election cycle by looking back at History. What I'm finding is that this year is a confluence of several different items from several different election years, which not only says we're heading for some massive catastrophe if we don't act soon, it also says that maybe, just maybe, you can look too hard and find connections anywhere if you have enough free time. But, it's how I see things. Corruption had been a central issue in the Presidential election of 1876. Republicans abandoned the struggle over the status of Freedmen in the south in the interests of a more lucrative ongoing battle with the Democrats over the spoils of office. Everything seemed to be for sale. And bosses in both parties were determined that it stay that way. As a result, African Americans in the South would have to endure another 100 years of bigotry until finally fighitng for their freedoms in the 1960s... and of course we know that everything has been peaches and cream on that front ever since. So the formerly liberal Republicans sold out and become tools of the corporate state. Meanwhile, the Democrats were already a coalition of the of the Patrician south, willing to also sell out to preserve what remained of the "Southern Way of Life," leading to the Gilded Age of amazing prosperity for the super duper rich while the vast majority of the country enters what's known as the Long Depression. Now, if this is starting to sound very familiar, just with the D's and R's switched, that's what makes this lesson so important. Theodore Roosevelt, Sr, father of our 26th President, said of the political climate around that time that he felt "sorry for the country as it shows the power of partisan politicians who think of nothing higher than their own interests. We cannot stand so corrupt a government for any great length of time." Curiously, the only reason we know Democrats as the social justice party is because FDR and LBJ alienated that southern Democratic base (causing them to switch to the Republicans) by actually, you know, deciding that all people deserve to be treated decently, and that all men are created equal. In this new Gilded Age of corruption, pay to play, special interests and Super PACs, it's up to the DFL to keep waving the banner of Progressivism as we slog through the maniacal partisan muck. No matter how conservative the national Democrats might lean or how full-on fascist the Republicans get, we must continue the movement forward for our nation and its people into what Hubert H. Humphrey once called "The Bright Sunshine of Human Rights." The time may come where the DFL becomes its own national, progressive party, showing that what works in Minnesota can work for the nation. Most importantly, one of our founding principles of the next few years must be that there is a difference between a (D) next to your name and a (DFL). Someone has to do it. For the DFL, our time is now. I've already spoken about how important it is to seek to understand a frustrated part of the electorate that is now approaching 50% of the country. Simply casting them as the bad guy in some two-bit melodrama isn't going to work, and in all truth hasn't worked for the past 30 years. 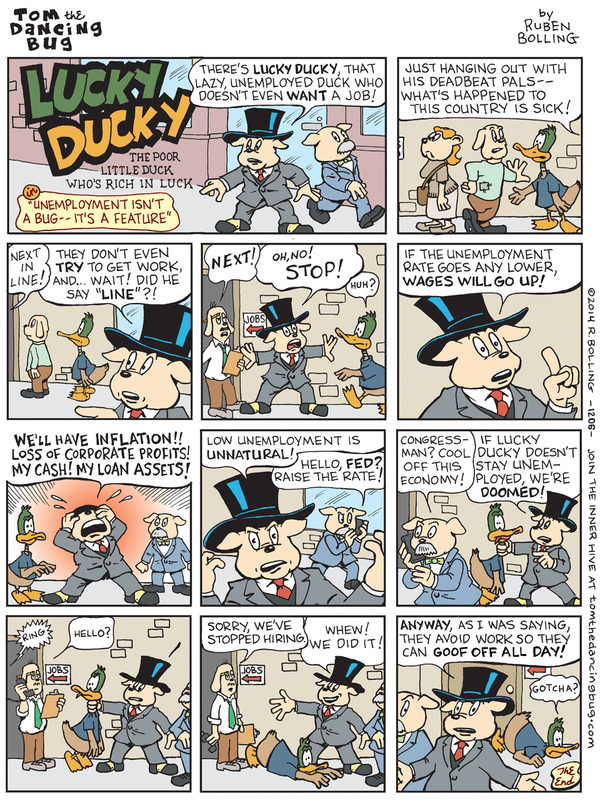 The rich have gotten richer, the poor have gotten poorer, and the middle class has all but disappeared. After 30 years of Reaganism, where we blame the victims of corporatism and upper-class-welfare by saying that they just aren't good enough people to get ahead in a system that is rigged against them... people stop believing the old line. They start to realize how badly the system is broken. They start wanting to fight the system. You're seeing it crop up all around the country: the Dakota Pipeline protests, the Black Lives Matter movement, the Bernie Sanders movement, the Jill Stein notoriety and, yes, the Tea Party and Donald Trump. More and more people are getting more and more frustrated and desperate with a system they feel has left them behind, and promises from establishment politicians have not rung this hollow in their empty pockets since the Gilded Age. Triangulation can't work when that much-beloved 51% of the vote is no longer attainable because 51% of the country may just want to burn down the house, even if they're inside, just to make sure that rich blankety-blank in the penthouse goes up in smoke, too. People are so, so angry. They feel they have been lied to. This isn't a question of asking if you were better off 4 years ago... it's asking if you were better off 40 years ago. And for many people right here in Fillmore County, the answer is no. And so, Donald Trump is a protest vote. He is a protest candidate. He is a protest being staged by a part of the electorate who has seen their power diminish in the past 40 years, and they realize this might be their last chance at relevancy. And they are so desperate, so angry for feeling cheated for almost four decades that they don't care if they have to destroy the country. To them, the country is already destroyed. Yes, there are racial elements. Yes, there are elements of ignorance. But much like Brexit, the fundamental misunderstanding comes from simply thinking they're all a bunch of dumb hillbillies who don't know how to vote "right." They are perfectly aware of how they are voting, and they don't care if it's destructive. They want change, and they have been waiting long enough. There is still time to win this, but bold steps need to be taken. The Democratic nominee needs to make bold and unequivocal promises to the electorate, and most importantly those promises must be backed up with a very simple bargain: if I betray any of these promises and stop working for you, the vanishing middle class who are thirsty for change, don't vote for me in 2020. It's not enough to say you will resign, because these same folks don't like the VP nominee either (although, as history shows, you can replace a VP nominee). You need to be willing to sacrifice your ambition and make a bold choice to show the people you actually give a damn about them. If you don't, simply put, they won't vote for you. I never thought I'd see NPR put out what was essentially a hit piece on someone who has been dead since the 1940s, but they did it. It was almost staggering to see the lack of any insight whatsoever on the part of what is supposed to be that liberal radio bastion, when ideals like full employment, weekends off, and pensions have been seen as a liberal brass rings for decades. Instead, we have publicly-funded radio telling us that we should be working more, and we should be happy about it. But let's examine the 40-hour week, shall we? New studies are showing that not only are workers happier when they work six hour days for the same pay scale as an eight hour day, but they are also more productive. Flatly put, an 8 hour day encourages goofing off. We've all done it: you punch in to work, get to chatting with a coworker, checking the news or even just daydreaming and before you know it it's halfway to lunchtime and you're out for a coffee break. Now, what fool is going to go up to their boss and say "Chief, I'm terribly sorry, but can you please dock my pay for the last two hours? I haven't been performing anywhere near up to snuff, I'm afraid." Heck, in a country like America where productive has far outpaced compensation, we're all scrabbling for every dime we can get. And so, we have a fundamentally broken system: people don't work as hard because they need the hours, but they're essentially wasting up to 10, 15, maybe 20 hours a week doing not-work. But no one's going to say anything about it: we've got a good thing going here, don't mess it up. If I got bumped down in pay, we'd have to give up some of the few creature comforts we actually have in this stagnant economy. And so, solidarity takes on a strange new twist: we have a largely union-less working population staging what amounts to a 20 year slowdown in work, all just to make sure we have food on the table. 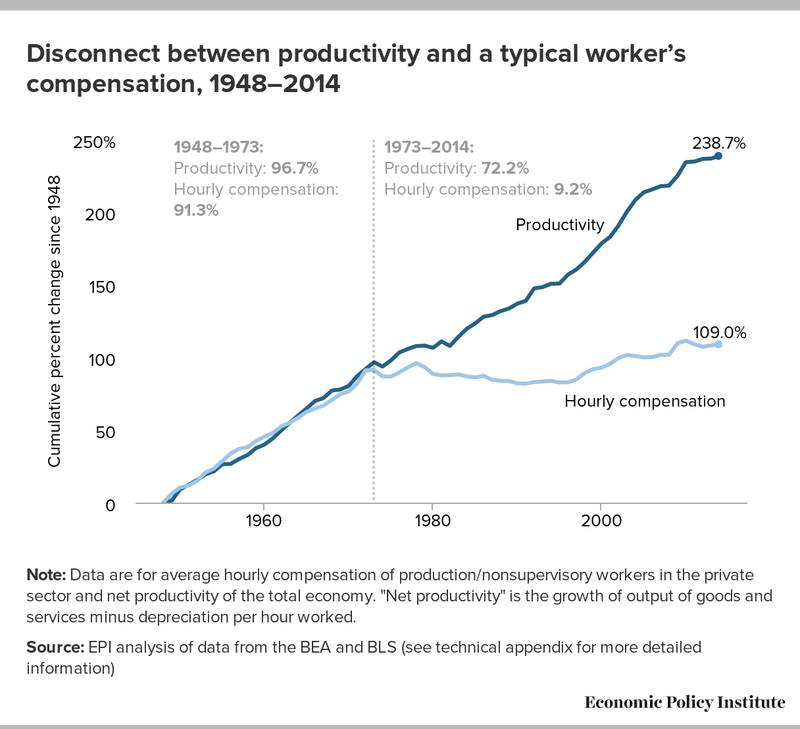 And, most despressingly, while we could push for less hours, better pay, and ultimately a happier and more productive workforce, 30 years of Reaganomics has taught us that the system is hopelessly rigged and that you just need to keep your head down and get as much as you can before the next boom is followed by the next bust. This isn't any way to live, particularly in the richest, most prosperous country the world has ever seen. Get involved: support labor, support organizing, support card checks, support solidarity. If we all were to work together, we could effectively spit in the eye of the selfish, objectivist, money-grubbing and greed-uber-alles culture that has put us in this thoroughly broken situation. As Ben Franklin one said, "We must, indeed, all hang together, or assuredly we shall all hang separately." Who knows what the next crash in this money-mad system will do, or whether it will put you, or me, or all of us out of a job. We can't afford to wait for the noose to come around our necks, we must work to fix the broken system now! A tisket, a tasket... Hillary Clinton's #@$% basket. This should have been the focus of her statement. This should have been what everyone was paying attention to. Unfortunately, the current state of broadcast media seems more akin to ambulance chasers than journalists, the leading comments got more play... which is an utter shame. I'm not Secretary Clinton's biggest fan; far from it. Like 60% of Minnesota, I supported Bernie Sanders in the primary. However, in the above paragraph Mrs. Clinton hit on something so incredibly important and necessary for this bizarre election cycle that it bears examination. It's easy to just write off Trump supporters as all evil or all racist or all stupid... but where does that get us on the day after election day? Fellow DFLers, we must remind ourselves that this is, as of recent polling, darn near half the population of the entire United States of America. To discount them outright as misguided, sad, or uninformed is to not only sabotage any chance of meaningful dialogue, but also to destroy any chance for future compromise and teamwork. There is a lot said by Mrs. Clinton that is true: after 30 years of triangulation, welfare reform, and trade deals, the Democratic Party is being perceived as a part of elites, and we must work to fix that. People are angry, and they would rather burn down the house with all of us inside it as long as it meant something would finally be done to address their desperation. We can't keep pretending like they don't matter. We can't keep insisting that they don't count. They are our constituency just as much as anyone else, and simply engaging in gang warfare of Red vs. Blue is what got us into this paralyzed state of government to begin with. Sit down with people. Talk to them. Listen to them. And when it's all done, and you say you're going to work as a DFLer to make things better, actually work to make things better for everyone. If we don't, we can't call ourselves anything better than those maniacal partisans on the right. We have to be better... but that doesn't mean we have to be nice. Reality has a well-known liberal bias, and we have objective facts on our side, particularly as the unique DFL: our policies work, but there's more that we can do. We need to make sure that everyone in Minnesota understands that we are working for the betterment of ALL, not just our donors or our friends. If we wall ourselves up in our fortress and say we're not as bad as the other person in the other fortress, that doesn't make us good. It's time we start walking the walk if we're going to talk the talk. As President John Kennedy said, "We choose to... do the other things, not because they are easy, but because they are hard." The Democratic-Farmer-Labor party has a unique opportunity to be the truly Progressive alternative and win the votes of not just 51% of the people, but 60, 70, 80 percent. It won't be easy, it will be hard, but it's what needs to be done to continue the excellent policies of Governor Dayton and continue Minnesota's reputation as a bright, shining Star of the North in terms of prosperity, equality, and most of all, compassion. I mentioned previously the similarities between this year's election and the tumultuous election year of 1968. As time goes on, this Presidential contest continues to defy nearly all historical trends... but it does have a tendency to borrow bits from here and there over American history. As a smart man once said: History does not repeat itself, but it rhymes. For about thirty years following the Civil War, we had a sequence of fairly unremarkable Presidents who did little to improve the lives of regular Americans. In truth, both Democrats and Republicans had their share of dirty deeds during what historians now call The Long Depression: whether it was the Southern Democrats' hard-dying of slavery that led to the essentially brokered Presidency of Rutherford B. Hayes (the Democrats all but allowed his Presidential win against Samuel Tilden in 1876 on the condition that Federal troops would depart the Reconstructed South) or the Republicans pivot away from radical abolitionism and Lincoln-like social justice to the pockets of big business, it's safe to say that there's a reason most teachers skip this area in high school history class: it's not America's finest moments. In the late 1800s, as the 19th century was coming to a close, you would have likely found a similar distaste for government and politicians as usual if you swept through the tenements of New York, the ranches of New Mexico, or even the farms of Minnesota. Back then, names like Carnegie, Rockefeller, and Morgan had obscene control of the American machine. Rackets like Tammany Hall bought the politicians, and in turn those politicians paid more and more toward the rich, making them even richer. Mark Twain called it the Gilded Age, where something rotten was simply covered in gold to look more pleasing. This would continue on for a few more decades, with more and more gold being ladled on top of decomposing garbage, until the entire thing collapsed in 1929. Which is why the 1896 contest is so very peculiar: it marks the beginning of a turning point for both of America's major political parties. Democrats and Populists fused their campaigns around the ebullient William Jennings Bryan, whose fiery speeches effectively roused the rabble who were sick and tired of what they considered to be a broken system presided over by bought and paid for politicians. The country had been in economic turmoil since the Panic of 1893, and Bryan was selling some radical economic ideas to a populous desperate for anything to shake things up. Meanwhile, a businessman named Mark Hanna all but installed his man, William McKinley, into the nomination on the Republican side. All of Bryan's fire and gusto could do little to fight back the moneyed interest, and McKinley won easily on a platform of "solid money" and not doing anything too rash. As public opinion seems to slide more and more in favor of Mrs. Clinton over her opponent, it seems 2016 could be 1896 all over again. What is important to look at, however, is what happened afterwards. McKinley, with the help of tabloid media, went to war with Spain in 1898. This not only bolstered the economy, but made McKinley look like a capable leader and secured his re-election in a 1900 rematch with Bryan. Unfortunately, McKinley's first Vice President, Garret Hobart, died in office and, in an attempt to stifle his rising star, the Republican party put that unapologetic Progressive Teddy Roosevelt in the largely ceremonial Vice President position. Chillingly, McKinley was assassinated by an anarchist in 1901, making those recent comments about "Second Amendment People" even more disturbing with historical context. Roosevelt was sworn in and kicked off an era of Progressive policies from both Republican and Democratic presidents. Following another catastrophic war, however, the moneyed interests were able to win back the country just in time to drive it directly into the ground with the Great Depression in 1929. As a final interesting note to the 1896 election, there was actually a little-known Third Party presence called the National Democratic Party, who attempted to keep the old guard of the conservative Democrats in line by running John M. Palmer and Simon Bolivar Buckner, two men pushing eighty years old. It is telling that the attempt to stop the populist and Progressive uprising in 1896 was spearheaded by two very old men who seem very out of touch; the same could be said for the old guard doing anything they can to stop Trump in 2016. While we may seem to be at a place now in American History that seems unprecedented, the last century tells a surprisingly similar story. The biggest lesson to take away from it is this: as DFLers, we need to keep to our progressive roots. It will be a long, hard fight, and there may be temptation to take more conservative positions as the Republicans fall into disarray, but that is sacrificing long term prosperity for short term gain. We must continue to fight as a unique and Progressive arm of the larger Democratic structure and demand policies that do well for ALL Americans, and in a few short years we may see our new Teddy Roosevelt finally make good on the political revolution that has been roiling for decades. If we do not stay the progressive course, however, history could repeat itself and a surprisingly progressive and populist Republican, like TR, might just pull the rug out from under all of us. But make no mistake: Progressivism will have its day in America, and that day is coming soon. I was once told that the old idea of the "American Melting Pot" was a little... off. In reality, I was told, America is more like a stew: each of the ingredients add something to the entire ensemble, but overall retain their own structure. America is much the same, with little outposts of culture here and there because America doesn't force assimilation. Where you might see some potato or carrot, you see the ethnic neighborhoods of Chicago or the Amish communities of the Midwest. What makes America so great is that we don't force the whole stew into a blender, because any cook can tell you trying to put hot stew into a blender will just make it explode. If you must blend a stew, either wait for it to cool down or use an immersion blender. It may take longer, and you actually have to plunge into the thick of things, but at least there won't be an explosion. You can't expect the stew to go by your timeline or your personal wants, unless you want boiling liquid on your ceiling... and maybe some people do. So you have your ingredients, and you prepare them: you first partially cook some of the ingredients with a little oil, add what will become the gravy, and leave it on to cook for a long time. If you're patient, you have an amazing dish... but what if someone looked at that stew pot and said "I bet I can do it better" by gussying it up? What if someone saw a perfectly delicious, if humble, dish and decided it needed more? What would being greedy in this kitchen get you? Let's say this person wants to add a buttery crust to the top of this stew, making it more like a Great American Pot Pie. Now, there's nothing wrong with a pot pie, in theory, and I'm sure we all appreciate a good crust/gravy combination. The only problem is that the crust is going to take some time to make, so you'll have to try to speed up the cooking on your filling to make up for it. So you take the 90% on the bottom and turn up the heat. In making this crust, you had to cut some of the butter out of the stew beneath. Now, the meat or the vegetables get burned, but that's okay, this person says, because the crust will make it all worth it. It'll be so decadent, such a sight to be seen, that everyone will forget if the stuff underneath it is slightly burnt. There's just one problem: in this person's quest to make the curst the envy of all, he added too much butter. To be blunt, the upper crust is too rich. As a result, putting in the oven will yield disaster: the crust will fall apart, and the stew underneath will boil up from the bottom, only hastening the destruction of the upper crust. Soon, instead of a tasty treat, you have an oily mess because the ingredients weren't distributed properly. In this person's quest to make something that looked super cool and fancy, it all ended in mushy, burnt nastiness. So don't always try to re-invent the wheel. Make sure your Great American Stew Pot gets enough oil, and don't send it all to the top. If you must have an upper crust (and you can, that's okay) make sure you make it of strong stuff, and go easy on the richness. It might turn out to be a teeny bit tougher up there on the top, but it's worth it to not have an underneath on fire and an upper crust that can't support its own weight. It's a recipe for disaster from the get-go, no matter how badly you want it to succeed. I know that sounds a little harsh, but it needs to be said, because when you have soggy, oily mush on top of burned filling, no one wins and, if you leave it the heat in long enough, hoping that will help re-form the upper crust... then everything winds up burned in the end. If all you care about this November is whether or not your person “wins” or “loses,” then head on down to the dog track. Politics is not about winning and losing. It’s not about the glory or the satisfaction. I know it sounds hard to believe, but there used to be a time in this country, not too long ago, where politics was actually about helping people. -Helping people is making sure they can go to the hospital. -Helping people is making sure they can go to school. -Helping people is making sure they don’t go hungry. -Helping people is making sure they have a roof over their heads. -Helping people is making sure they have what they need to not only survive, but thrive. None of what you, personally, want matters anymore. It never should have mattered in the first place. It’s about all of us. It’s depressing that the country has to be rocked by instability, crisis and the advent of fascism for this integrity to return to our political discourse, but now that it has you will see an entire generation rising, and the sons and the daughters are beyond your command. They demand that things be done differently… and, oddly enough, it’s the way things were done for their parents, or their grandparents, before the specter of Watergate forever killed two generations’ perceptions of government. We’re ready to believe again. We’re ready to stand up for what we believe again. We believe in America: unabashedly, uncynically, unrepentantly. We were told great stories of the America where our parents or our grandparents grew up: income equity, social mobility, and moving ever-forward toward a just and peaceful future. We want that future, because we were told it was meant to be now. We understand that it can’t happen overnight, but we are appalled at how far things have fallen back from where they were, and now, with almost nothing left to lose, we are willing to fight and claw our way back onto equal social footing with the other prosperous nations of the world. In 1999, my family moved to Canton, Minnesota in Fillmore County, population 343. I went to high school in Minnesota, then returned to Wisconsin for college. Soon after I graduated college, our country found itself turned upside down by a dangerous political movement that threatened everything that once made America a shining beacon of progress and prosperity. There was, however, a bright spot in the Star of the North, and I moved my Chicagoland wife and newborn daughter back to Minnesota in 2014. We both know Minnesota will take care of our family and our future far better than what the fates have in store for other nearby states, and we are happy to call Minnesota our home. Through the terrific SELCO library-loan program, I've had a chance to absorb your 2010 memoir, The Good Fight: A Life in Liberal Politics. Though I considered myself an independent for the first twenty years of my life, 2010's drastic shift toward neoconservatism has galvanized me into action. I am now active in my local county DFL and I am looking to get involved in future elections from 2016 and beyond, and I want to do my best to carry forward the ultimately vindicated policies championed by Humphrey, McCarthy, Wellstone, and yourself, among others in the DFL. In reading your book's chapter on the 1980 election, my historian's training was struck by the amazing amount of parallels drawn between the contested primary of 1980 and that of 2016. Your book mentions that so much had changed from the 60s to the 80s in both the American economy and collective consciousness that playing the “old songs” was unfeasible. The question I am begging of you is: Do you think 2016, or possibly a future election, could see a similar dynamic come into play, but in reverse? In candidates like Elizabeth Warren and Bernie Sanders, we're seeing a growth in support for old-school, FDR- and DFL-style liberalism, so much so that it seems the New Democrat platform is quickly becoming the old band with the old songs. If used properly, a national democratic (or even a national DFL) platform or slate of candidates could form a Roosevelt Revolution to counteract the Reagan one. We have the youth on our side: you mentioned on page 271 that unemployment approaching seven percent is dangerous, while the BLS reported that youth unemployment was 12.2 percent in July of 2015. You mentioned that adding inflation to unemployment to create a “discomfort index” would cause a problem if you got over nine. Adding the roughly 2% inflation puts us well into trouble territory. Using your own works, it's easy to see why today's youth (now the largest growing voting block) want to give the policies of your youth a try: soaking the rich, investing in infrastructure, and making progress in new industries like renewable energy or sustainable food production. It has worked before, do you think it can work again? Do you think time is ripe for a new group of Mondales, Humphries, Carters and Muskies to bring liberalism back to the people? Your memoir and experiences as Vice President seem to suggest so, and I would gladly appreciate any thoughts you have on the matter. When I was a boy, my mother uncovered a picture of you she had snapped during the '84 campaign. When I asked who you were, my mother said you were a good man who told the truth, whether it would help get him elected or not. That snapshot now sits at the top of my refrigerator, and when I hold my baby daughter in my arms and she stretches out her little hands, I make sure to tell her “that's Fritz.” You were right. Hubert Humphrey was right. Jimmy Carter was right. Now, it's time for liberals to come in from the wilderness and pick up the good fight once again. I truly believe, after reading it in your own words, that the time has come. So... what are your thoughts on the matter?